Sarkodie Launches Clothing Line-Sark Collections…Would You Ever Buy? Black Stars’ head coach, Kwesi Appiah has announced the final 23-man squad to represent Ghana at the 2013 edition of the Africa Cup of Nations scheduled to start from January 19 and end on February 10 in South Africa. The Ayew brothers of Andre Dede Ayew and Jordan Ayew are not in there. The latter just didn’t make the list whiles the former pulled out due to an injury. 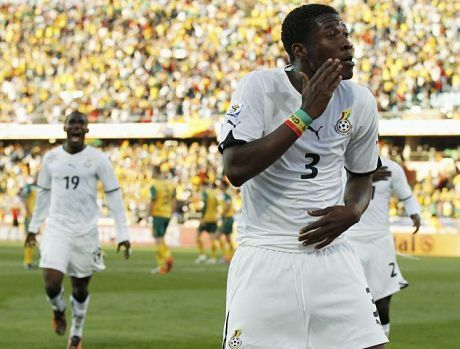 Also striker Asamoah Gyan has asked us [Ghanaians] to count on him to bang in the goals. Can we trust him this time around? Though Akwasi Appiah is trying to be harsh on Ayew bro’s but he is right this time around to drop Dede due to his silly excuse. The final list will be submitted to CAF on wednesday and that is the day Dede decided to report in camp that his Doctors are accessing him? Meanwhile GFA provided Plane ticket with promise of getting Experience Doctors in Arab to attend to him and Marseille released him. @Caliber and Dr, pls show me a country without any trophy n i’ll tell u abt indicipline in dat team.